Ever wanted to play some music when you open up the menu? For example, on the map, you might have the regular map music playing, but then when you go to the menu, you have a separate BGM specifically for when players are going through the menu. With this plugin, you can do that just that! Not only can you choose what BGM to play, you can also change it at anytime during the game with events. Download the plugin and place it in the “plugins” folder in your project’s “js” folder. Then open your Plugin Manager (F10), double-click an empty row, and select the MenuMusic plugin. Followed by a “Play BGM” command, where you can select the BGM to play. I am having a similar bug as Code Goodrich. When I save the game and exit to the title screen or close the game completely the menu music continues to play instead of the BGM on the stage. I have tested this on many maps and made sure all maps had their own BGM just in case I’d left them blank but this was not the case. My game version is on 1.5.2 because it is the most stable for many of my plugins. If you could find a fix I’d love to use this plugin but for now I am unable. Um, I have a problem. I have made it to where it would play Compassion when you opened the menu at the beginning of the game, but when I play it, before the part that was supposed to allow the BGM to play when I accessed the menu, the BGM of the map was completely gone! Opening the menu and backing out won’t work, the only music that plays is the BGM when I open the menu. I’ll try saving my game and going back. I’ve come across a problem. When I save and load a file, the background music automatically plays the menu music, even though it’s not supposed to. Is there a way to fix this? Is there anyway to fix this error? I’ve come across a huge problem with this plugin, it has actually disabled one of my other plugins and now I can’t properly use the other plugin as long as the Menu Music plugin is turned ON. I’ve tried moving the plugins around but nothing. I would hate to get rid of this program for the sake of another one being properly used. However, I after you change the music of the menu, I do not know how to revert to the default of the music on the original map. The plugin works well. I found a slight issue for me though. It will play the music in the front menu but when using sub menus it goes back to no music. Is there a way to fix this? Which ones are the submenus? How are you accessing those menus? Sub menus would be for example clicking on item. A submenu of Item comes up with other options. This works for the base menus that come default with RMMV. I noticed that when using submenus from Yanfly’s MainMenuManager that are created it causes the BGM to stop playing. I was just wondering why it would only affect that menu as the menus run through the same plugin, even the defaults. Do you have any thoughts? 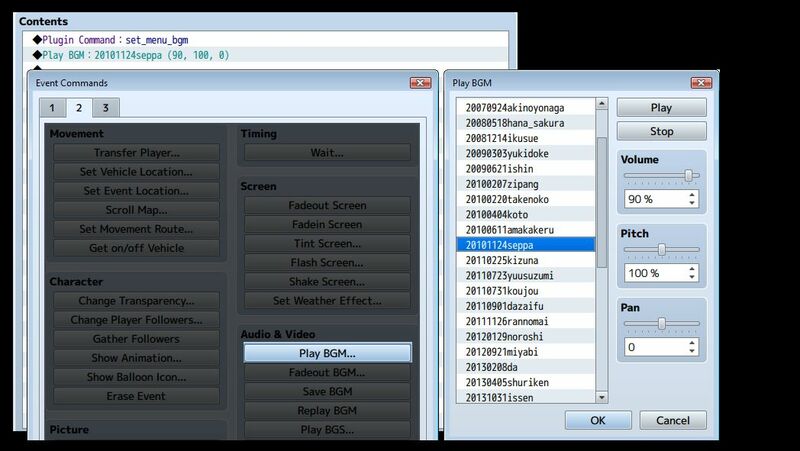 The plugin assumes that the menu BGM autoplay will only occur if you access the main menu directly. If you access other part menus without going through the main menu, the menu music won't play. I had a report about this before but haven't found a solution that would allow me to accurately capture every possible way to enter something that is considered a menu, without forcing users to write down all of the scenes where the menu music should play. However, that might be the solution I will end up implementing.